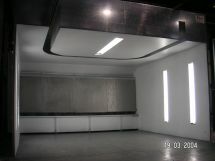 Including ovens, booths - tailored for both contract coaters and OEM's. 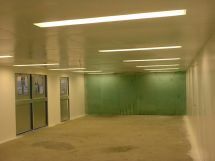 To improve efficiency and air movement within the enclosure, we provided a recessed channel for the overhead track system. This reduces contamination of the track mechanism and subsequently creates a clearer and safer workstation for the operator. Many types of spraying equipment available for a vast range of applications. 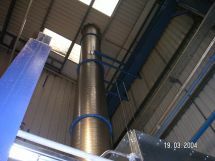 Dry Filter Spraybooths with centrifan, manometer and 'full face' extraction system. 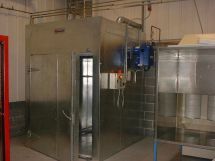 Enclosed Booth with pneumatic component doors and personell doors. 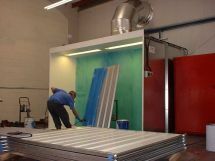 Working enclosure coated with peelable booth coating which improves brightness and extends the life of the booth. 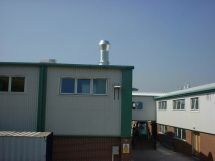 Top outlet, rises vertically, penetrates the roof and discharges to atmosphere at approximately 8m above ground level via an EPA compliant cowl. With extended height working enclosure, twin fluorescent light fittings above safety glass panels and a lifting gear access slot. 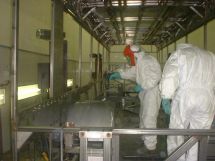 The exhaust specification is designed to compensate for this additional opening, so maintaining negative pressure within the booth and ensuring containment of overspray.